Trevor Noah is best known as the host of the Emmy and Peabody Award–winning program The Daily Show in the US, succeeding the legendary Jon Stewart. But his roots are actually in stand-up comedy. He toured his first one man show in 2009. His second show The Racist was a sold out run at the 2012 Edinburgh Fringe that became one of the most talked about shows at the Festival that year. And now he’s back with a new show touring New Zealand this September! 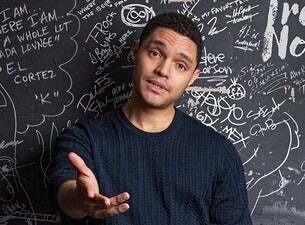 Noah has hosted numerous television shows in his homeland South Africa including the South African Comedy Festival and two seasons of his own late night talk show Tonight with Trevor Noah. He made his US television debut in 2012 on The Tonight Show with Jay Leno and has also appeared on Late Show with David Letterman, becoming the first South African stand-up comedian to appear on either show. In 2015 Noah was named host of The Daily Show. Don’t miss seeing Trevor Noah Live this September! This will sell out!